The Aviform Prehistoric Geometric Sign – Drawing of a Cliff & Birds. A romance, a dream, a fantasy. These cliffs in Quercy Périgord, where the people of the Ice Age once lived. They mark my mental landscape, as they must have also made a deep impression on the minds of the hunter-gatherers. Romanticism attempts an affective fusion between person & her enviroment. Science attempts to practice detached objective observation. The person outside of her enviroment. The slow methodical sifting through of data & remains… But can we ever truly take off the lens of our own vision that shapes that which we think we are clearly seeing… Also, can we we ever see as these hunter-gatherers saw? What would they have made of my notions & prejudices? As an artist, not as an archeologist with their attempts at objectivity & science. Prehistoric art speaks to me 30 000 years later. Not as they intended it to communicate … But should we delegate all of our human past uniquely to be the domain of science? ‘We will never truly know what they meant’ as the guide drones on at every visit… But human history is a history of evolution, where one understanding evolves into another. Intentionally or not. 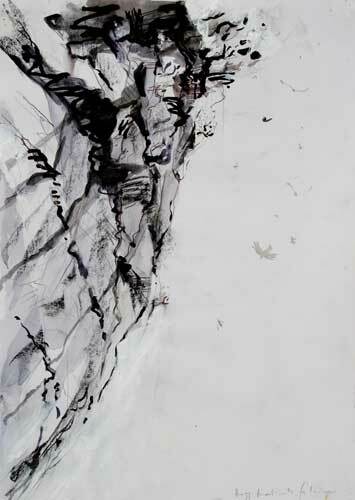 However, preamble aside… one thing is certain : Birds live in cracks & holes of cliffs , than as of now. OK Doubtless not the same species. No swifts in the Ice Age? Crows maybe. Owls yes. Buzzards probably not. But the vertigo of looking up & seeing the birds swirling around. Then as now. While animal depictions are a common theme in most known regions where rock art is present, the choice of what to portray seems to be contextual, with image-makers generally choosing contemporary fauna from their local environment (Rice and Paterson 1986; Clottes 1996). (aviforms) are also concentrated in the later half of the Ice Age (almost entirely from 22,000 years onwards), strongly suggesting that this may have been a local invention/innovation, rather than having been something that was brought with the first humans who moved to this continent. 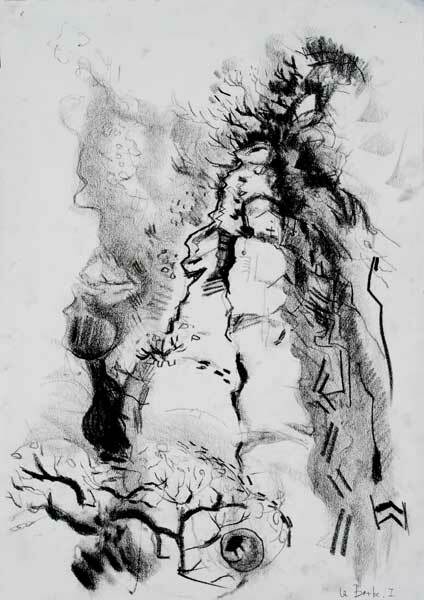 Aviforms are also sometimes named ‘Signes du Placard’ , after another painted cave in SW France : Grotte de Placard in the Charente, following the tradition of naming prehistory after eponymous sites, the geographic place where the element of prehistory wa s first found. Hence cro-magnon, Mousterian, Gravettian, etc. (Most of which are found in France by French archeologists & where accompanied by proud nationalist rhetoric of ‘Les Premiers Francais’ …) Apparently most aviform signs in prehistoric rock art are concentrated around South West France, with a particularly high density of repetition around the Célé valley in the Lot. 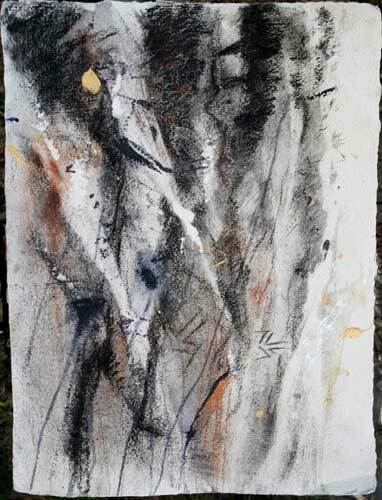 In the nearby painted cave of Pech Merle, not far from the cliff in my above drawing, there’s the famous ‘wounded man’. A conjugaison of aviform sign & a figurative depiction i.e. the sign doesn’t exist on its own (but we don’t know if this is intentional or not, other than comparing to other groupings of drawings in the cave, where again sign & figuration co-exist in the same grouping). The aviform sign is attached to a drawing of a man with lines coming out from his body. Some have interpreted these as spears. Others such as Professor Lewis-Williams reads them as suggestive of as symbolic depictions of the physical cramps that shamans sometimes undergo before entering a trance state. A stray thought : why not wings? The dream of flight occurs to most children & lucid dreamers… a prehistoric superman power cape? Prehistory is full of depictions of humans dressing up as other animals.